It was business as usual for Tennessee basketball on Tuesday night. Well, for the most part. The Vols welcomed the Arkansas Razorbacks to Knoxville and promptly ran them off the court by a score of 106-87. Five different Volunteers reached double-digit scoring as Tennessee scored 100 points in an SEC game for the first time since 2008. With the win, Tennessee is just the third major conference team to win each of its first four conference games by a combined 100+ points – joining the 2000-01 Duke team that won a National Championship and the 2012-13 Florida team that went to the Elite Eight. 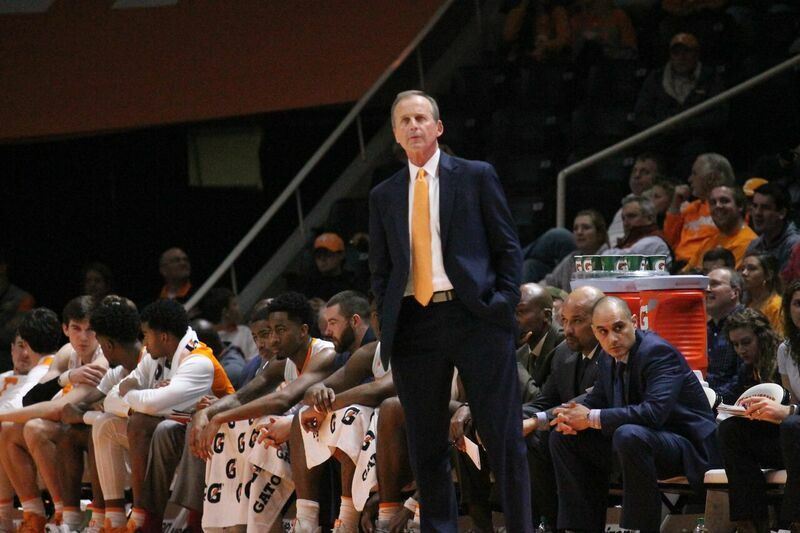 But following Tennessee’s 11th–straight win and their 15th victory of the season, Rick Barnes was not a happy camper. No. 3 Tennessee (15-1, 4-0 SEC) blitzed the Razorbacks (10-6, 1-3 SEC) in the first half, leading by as many as 25 on its way to a 55-34 lead at the half – all while Admiral Schofield scored zero points in six minutes due to foul trouble. Lamonte Turner and Jordan Bowden led the Vols in the opening 20 minutes, combining to score 25 points on 5-of-5 shooting from the 3-point line. Grant Williams added 12 points thanks to eight free throws. The second half was a different story, however. Arkansas out-scored Tennessee 53-51 in the final half as the Hogs held Williams to 0-of-1 from the field. Jordan Bone was also held to without a field goal in the second half despite finishing with eight points on 2-of-10 shooting. Bone did tally eight assists on the night, though. “The second half, I give Arkansas all the credit because they came out and continued to fight and score,” Barnes said. “We did not have an answer for it. While Tennessee turned off its killer instinct in the second half, Arkansas played lights out. After shooting 37 percent from the field and 30 percent from the three-point line, the Hogs shot 57 percent in the second half and 46 percent from three. Isaiah Joe, Mason Jones, and Reggie Chaney all reached double-figure scoring despite potential lottery pick Daniel Gafford playing just eight minutes in the second half due to foul trouble. The trio combined for 34 points in the second half, shooting 13-of-22 from the field. Arkansas out-rebounded Tennessee 16-13 and forced the Volunteers into 10 turnovers. Barnes’ message to his team continues to be consistent: If Tennessee is going to achieve what it wants to achieve this season, it has to get better. In building towards a potential championship run, the Vols took a step backwards in the second half against Arkansas. “It’s a matter of building, playing into your role,” Barnes explained. “We have to get better, and we know we have to get better.